Art + Robots = Crazy Fun! This is a simple enough test. Following the instructions on the back of the toothbrush package, you simply need to insert the battery into the toothbrush and turn it on. I found that some of the toothbrushes were a bit temperamental even at this step. If the toothbrush didn’t work at first, I give the brush a gentle shake or smack with my hand. On the rare occasion that even that didn’t turn the brush on, I provided a new battery and that fixed the problem. This step takes a little muscle and the needle-nosed pliers. 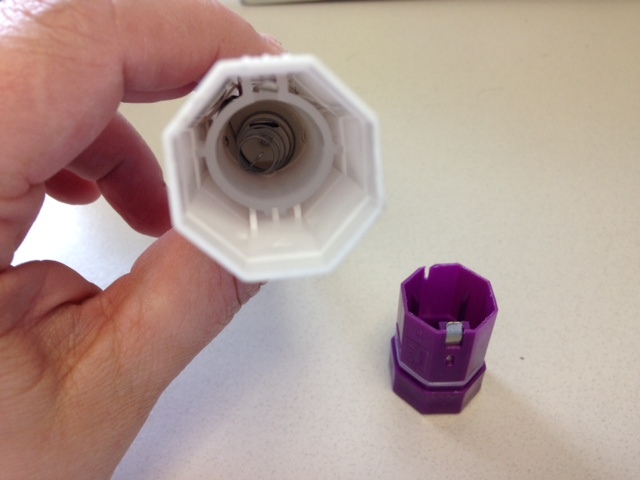 Pull the bottom off the toothbrush, remove the battery, and look inside. You’ll see a circle of plastic – that’s the top of the battery casing. You need to grasp one edge of the casing with the pliers and firmly yank to pull the battery casing outside of the toothbrush casing. 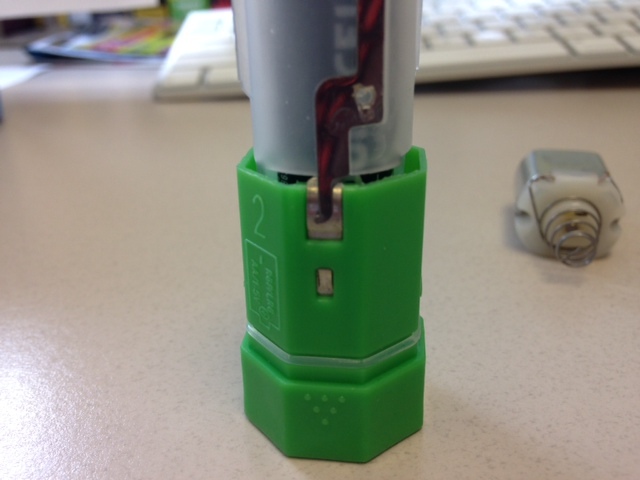 On a rare occasion, the metal piece attached to the battery casing pulled off during this step. If that happened, I had a spare toothbrush on hand for my scientist to use. This step was a favorite for a lot of my scientists 🙂 With luck, you may find that the motor and spring naturally fall out of the toothbrush casing when you pull out the battery casing. If that doesn’t happen, you need to shake it loose from the toothbrush. My scientists and I discovered that the best way to do this was to the throw the toothbrush down onto a carpeted floor. 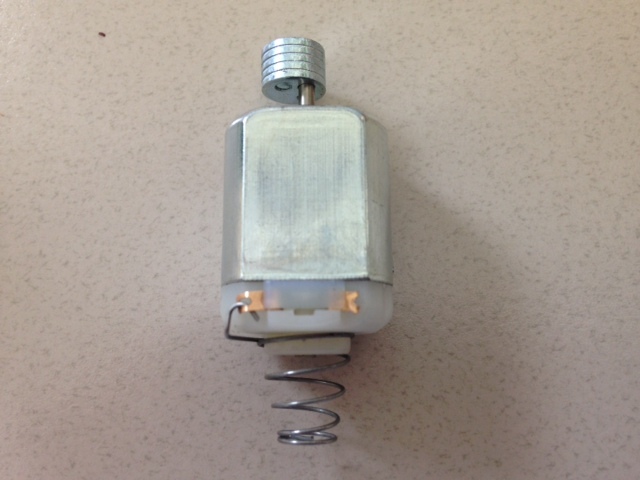 If you use this method, be aware that the spring may detach from the motor. It’s easy enough to hook the spring back onto the motor, but you may lose sight of the spring itself, especially if you have a dark-colored carpet like we have in our program room. In a few cases we needed to crack open some spare toothbrushes simply to pirate the spring piece for one of my scientists. 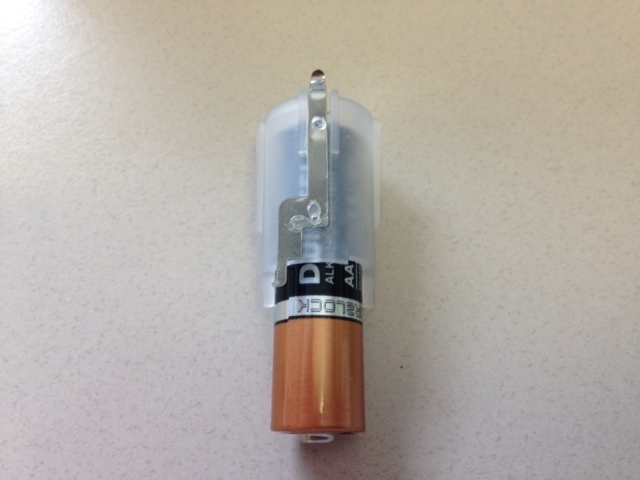 You’ll notice in the picture above that the metal piece attached to the battery casing has a longer straight piece that sticks out above the smooth, curved edge of the casing – and a shorter end that sticks out from the end that has two little plastic “legs.” When you put the battery back into the casing, you want the positive end (with the bump) to stick out from the same end as the little plastic legs. This is by far the trickiest step – not because it is difficult to put the pieces together but because the connections themselves need to be spot on or you won’t have a functioning motor. Looking at the motor and spring, you’ll see that on one side there are two small copper connectors on either side of the motor. 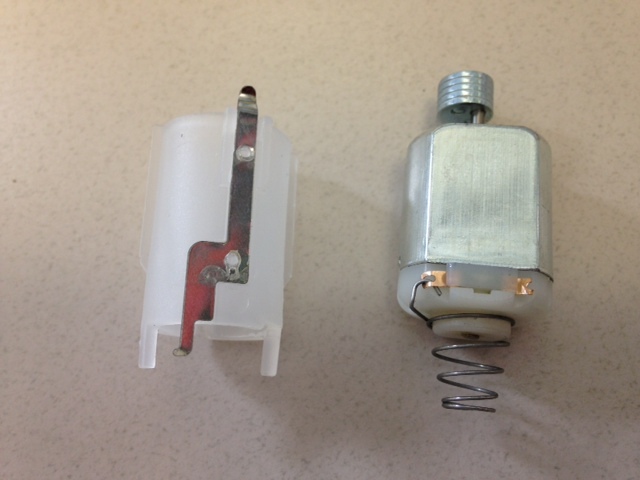 The copper connector on the left is attached to the spring – the connector on the right is slightly curved but is not attached to anything. It is the right copper connector that you need to work with. You need to hook and/or align the metal piece still sticking up from the top of the battery/base component to that free copper connector on the right. I actually found it very handy to have the on/off switch of the base in the “on” position for this step so you can be sure when you have all pieces properly aligned. 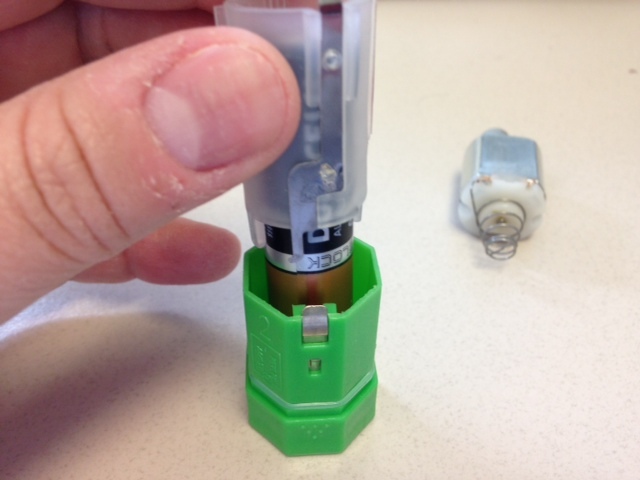 Once your connection is good and your motor is spinning – with the the base still turned “on” – firmly tape the motor and spring to the battery/base component with the spring in direct contact with the battery. I also found that, on occasion, I needed to jury-rig the whole assembly once everything was taped together because despite repeated taping attempts the battery in the base kept slipping a little. 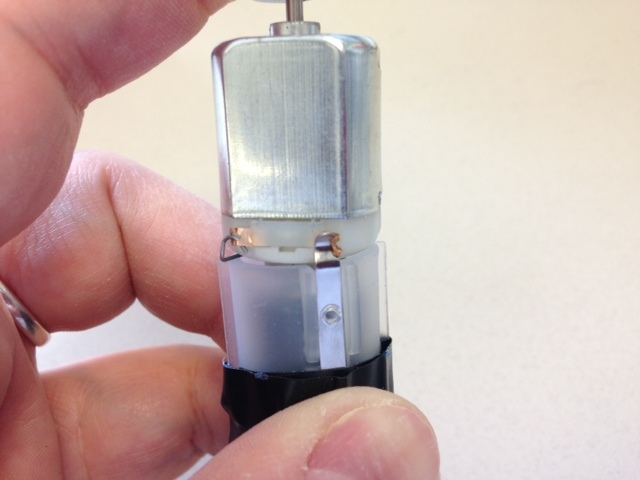 This fix was simple enough – a double-wrapped rubber band placed around the whole assembly length-wise (you will have to wiggle it a little to make sure the on/off switch is still accessible, and you need to make sure the spinning portion of the motor is free on the other end). This fix consistently worked for several of my scientists and me. Now we’re getting to the really fun stuff! 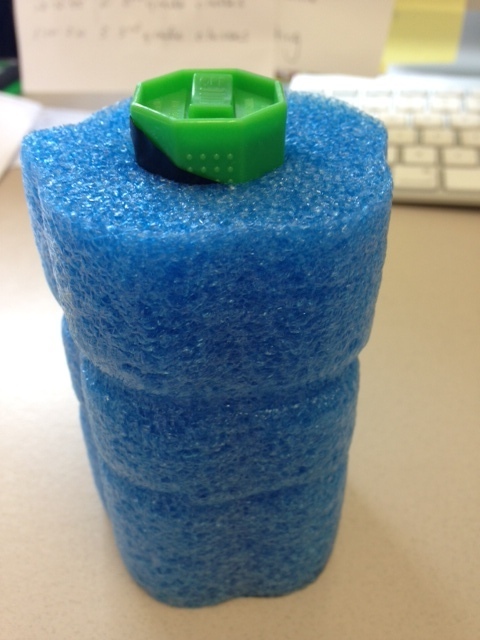 I cut manageable pieces from the styrofoam pool noodles (about 4.5 inches in length) – you can do this with scissors, but I found it much easier to do with a box cutter. [NOTE: I did this step in advance of the program and then just let my scientists choose their favorite color.] 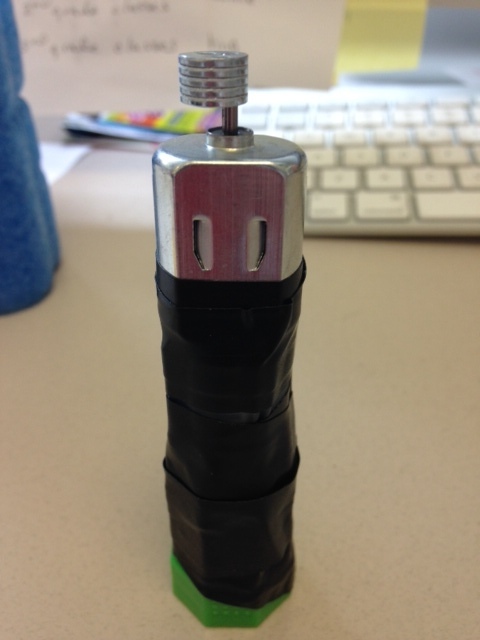 You take your fully taped motor assembly and push it into the hole inside the pool noodle piece, making sure that the on/off switch remains exposed for easy access. [NOTE: You should once again test your device to make sure no connections have come loose by turning it “on” at this point. 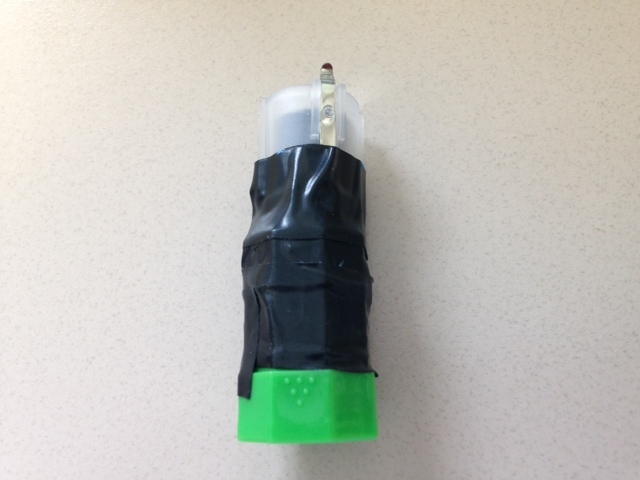 If the motor is no longer turning on, simply pull it out of the styrofoam piece and retape where necessary.] 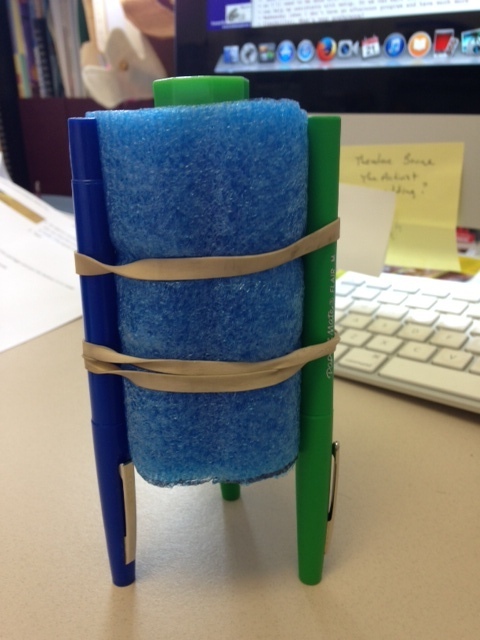 Place rubber bands around the outside of the pool noodle piece near both the top and bottom of the piece. Attach as many markers as you want by pushing them under the rubber bands, with the inked ends sticking out from the opposite end of the on/off switch. Now give the piece a good test by placing it onto a piece of scrap paper and turning it on. Now that you have a fully functioning device, truly transform it into an “artbot” by decorating your robot and giving it some real personality. 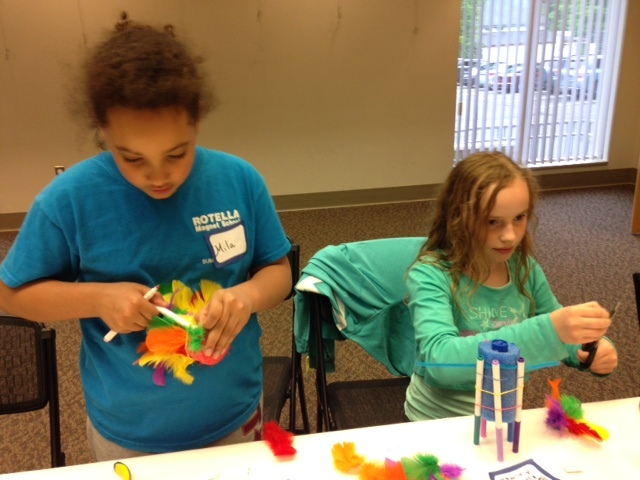 I provided our scientists with pipe cleaners, googly eyes, feathers, and fun buttons. Some artbots can be made using plastic cups and the like, but the beauty of the styrofoam pool noodle pieces is that decorating is a snap! 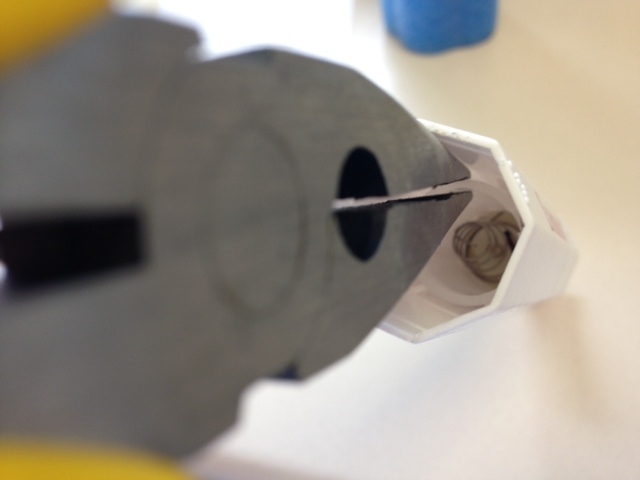 All you need to do is push materials directly into the styrofoam – no glue or tape required. Now you can just have some fun 🙂 I actually covered our usual program tables with paper so my scientists didn’t even have to worry about scrap paper. Once the artbots were assembled and decorated, my scientists had free reign of table surfaces to create their art. At some point, of course, the battery will likely wear out and you will need to pull the motor assembly out of the styrofoam, remove the tape, and replace the battery. But that’s a simple price to pay for such a fun gadget! Hi there! My name is Lindsay Schluter, and I am a Youth Services Librarian at Winnipeg Public Library in Manitoba, Canada. I was very excited to try out your ArtBots program at our library….but I’m having some trouble sourcing the right electric toothbrush. 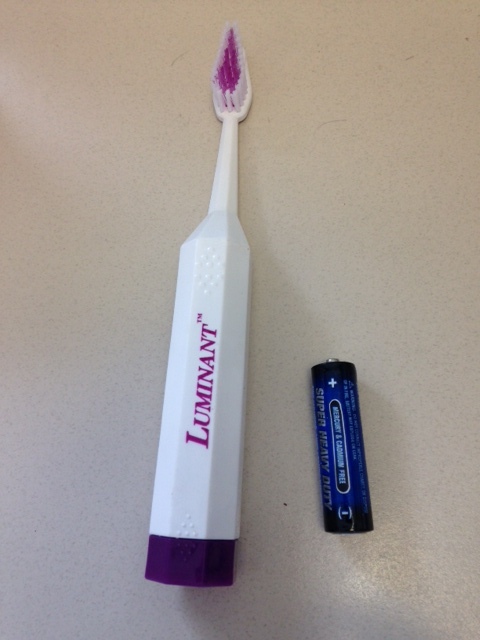 I’ve bought two different types of electric toothbrushes, but when I crack them open, they just don’t function in the same way as the one you used in your example (Luminant brand). The on/off switch on every electric toothbrush I can find is on the upper portion of the brush (not the bottom), and the motor is set up in a totally different way (no spring). I’ve been looking online to see if there is any way to buy Luminant toothbrushes, but even Amazon doesn’t have them. Is there anything you can recommend? Hi, Lindsay! So glad to hear that you want to give this program a try…my kids LOVED it. I don’t have an alternate to the Luminant toothbrush to suggest, but you can try modifying the program itself. For example, Wired magazine online posted instructions for how to build an Art Bot (http://archive.wired.com/geekdad/2012/05.ff_artbot/). Their instructions require assembling bots using low-voltage DC motors with wires on contact points to the batteries. The program may run a little pricier this way, though, unless you can find a way to harvest parts from recycled objects. You might also be able to find some kits online for “brush bots” that would include parts to assemble using separate motors (and wouldn’t require extracting them from an electronic toothbrush). I did also see that there are at least a few Luminant toothbrushes available on the American Amazon site – so if you can order from the American site you might be able to get enough to try my version of the program with a small test group of kids [I know that I’ve been able to order from the UK Amazon site in the past from America]. Hope that helps! Pingback: GS Meeting 10/23/14 | Plant, Plant, Electro...What? Thank you for this awesome idea! I was a little intimidated to try it at first but your instructions were super easy to follow. It was less then a 5 min project the first time I tried. I found Dr. Fresh Velocity toothbrushes for $1 at Big Lots. Thanks again!